I put the idle animations into UDK today and put together a very simple AnimTree. I still need to finish the walk animation before I can start the scripting and making her into the actual player pawn-bit, but I'm finding it really hard. So what you can see here is that she's got four idle animations which she loops between randomly. I'm sorry the video is so long, but she wouldn't do her kick animation. I'm going to talk a lot about spreadsheets now. You are free to stop reading. We had a lecture today about project management. It was very helpful and I wish we'd received this lecture earlier. I realised I really needed to get my spread-sheets on. Not only will it help me now, it'll also help me with documentation later. 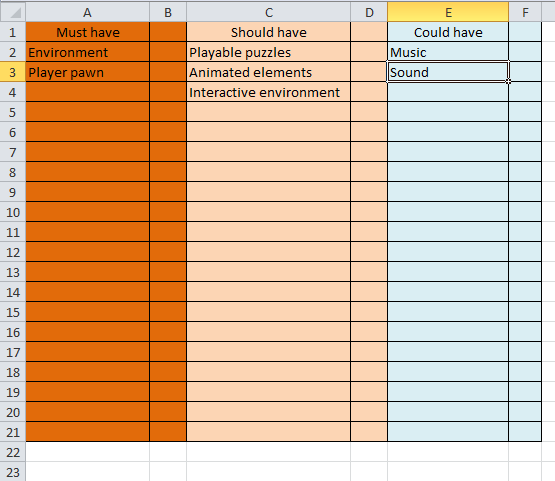 I got a lot of help from Shay putting these together, so I've made three spreadsheets. One is a list of things I absolutely must do (making the level and the player pawn) things I should do and things I could do it time allows. The second is a day-to-day schedule containing a list of tasks I've done that day, weekly milestones, changes in the schedule and so on. Having this also lets me estimate how long a task will take if I need to complete a similar task again. I've put in what I've done the past three weeks as well, for the sake of documentation and visualising what I've done and the time spent. It's a good thing I've been blogging almost daily, so that was a pretty simple matter. The third, and most important spreadsheet contains my asset list. I really need to sit down with this list over the weekend and fill it out, but the gist of it is that it contains file information like what texture sheet belongs to this file, what is the actual mesh named, where does it belong and so on. 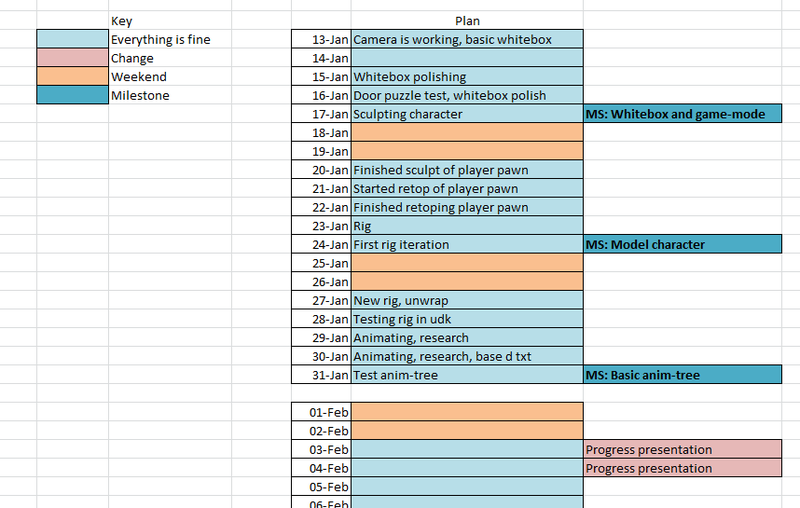 It also contains the production pipeline I have to go trough. Maybe this seems unnecessarily complicated to most people but for me visualising tasks in this way is really going to help. I can only hold so many thoughts in my head and when I get stuck, it's because I have so much to do I can't keep track of things any more. So I really think this is going to help. I'm going to figure out how to put this into a google doc so that others can view these. I mean, I don't know why you would want to look at my spreadsheets, they are very cute but rather boring. It's mostly for my tutors I guess.